Lenovo has just published a YouTube showreel of most if not all the products it will be launching at CES later this week. You can have a look below at it, but briefly you will see new Moto smartphones and accessories, refreshed ThinkPad and Yoga devices, a smattering of smart home devices and a pair of new Lenovo Legion gaming laptops. 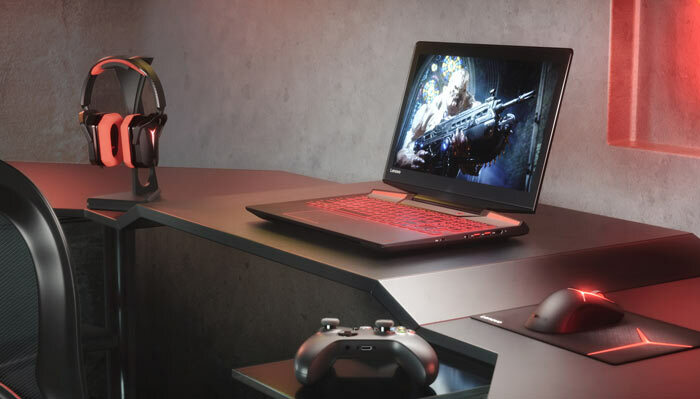 The new Legion range of gaming laptops from Lenovo are both 15.6-inch screen based and both feature an Intel Kaby Lake processor and Nvidia GeForce GTX 10X0 GPU. The Legion Y520 is one of the first laptops packing the GeForce GTX 1050 Ti. It comes with a starting MSRP of $899 and will be available from February. This higher-end gaming laptop is quite a bit heavier and thicker but does offer a step up in GPU performance, Dolby Atmos sound, and longer battery life. At HEXUS we reckon the GTX 1060 is designed for FHD or QHD gaming so the Legion Y720 UHD screen option might not be an attractive upgrade option. Lenovo Legion Y720 laptop pricing starts at $1,399, and it will be available from April. Lenovo has also updated its 2-in-1 offerings with the Miix 720 and uploaded a product tour video (see below). The latest Miix is powered by up to a 7th Generation Intel Core i7 processor and is built around a 12-inch QHD+ display. Enhance the tablet functionality with the provided keyboard and optional Lenovo Active Pen 2 accessory. This machine features Lenovo's 150 degree watchband hinge on its kickstand, Thunderbolt 3, and a Windows Hello compatible camera. Available from April, the Miix 720 will cost from $999 and come in either champagne or iron grey metallic. The Miix 720 is actually pretty sweet. TB support and all. We'll have to see how the battery life is, but it'll be a good competitor in “TB3 Convertibles” such as the Asus Transformer Book.